This week, I happen to be off from work and got to the hobby store at the regular time and was determined to get a game in. 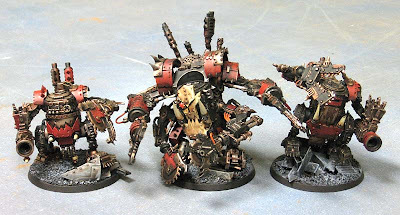 The resident Ork player was buying all kinds of Blood Angels stuff for his "new" army and was proud to show me his recently painted Ork Kans and Dreads. He has tightened up his painting a bit with these new models and it shows. They look absolutely fantastic on the tabletop. It's amazing what a little brush control will do for the look of your models overall. After our usual chit chat session, we got down to gaming. This week, I figured I would be facing Blood Angels for sure. 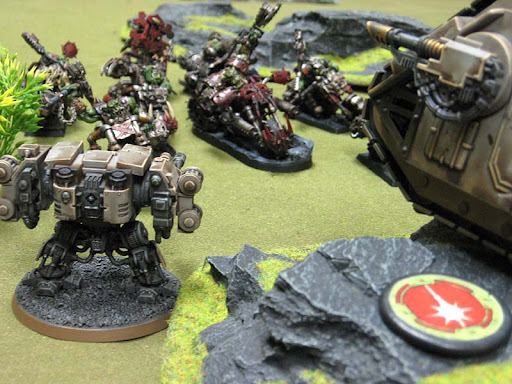 I ended up facing off against Orks... and ALL the kans and Dreads I just got done photographing. Just my luck. I'm not gonna lie, I thought I was pretty much doomed after seeing him lay out his army across the table from me. At 1500 points (of course I was over by 5 points and using Forge World dreads) he still had me outnumbered by 3 to 1 and had 8, that's right, EIGHT Kans and Dreads set up. He did the gentlemanly thing and offered to let me conceed right after deployment, but I was there and I figured I already set up my stuff so I might as well play now. I was tempted though. I was sure it would be a short game when it came up Capture and Control with Pitched Battle deployment. I thought I might help speed things along by deepstriking my termies and throwing caution to the wind. This is what came lumbering along my left flank. For those who don't know this trick, that lone Ork running along with all these dreads and kans has the ability to give them a 4+ cover save as long as they stay close enough to him. As soon as that little guy came over the hill and into line of sight, I promptly ended that party. This is the other treat I had barreling right down the middle of the board towards my objective. The biker squad of doom. Good times for everyone. It took all of my shooting for a couple of turns to whittle them down to something manageable. I almost had them broken at one point, but they kept coming. In the end, I finished them off. 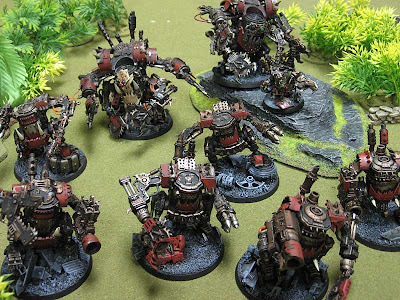 The Mortis pattern dread with dual lascannons can real clean house on those guys. Wouldn't you know I won the game thanks to my "live fast, die hard" deepstriking. I dropped both of my Terminator squads on his objective and ended up being the only one holding an objective at the end of Turn 7. I did end up trying three times to get one squad onto the board though. The first time, they scattered off the table, the second time, they scattered into combat, but the third time, they hit home. I want to get my list under 1500 points legitimately so I'm thinking about dropping the Librarian and adding something else, but I'm not sure what to add. I really want to stick with the Deathwing theme, but I enjoy the flexibility this army has now and I don't want to lose that by not choosing my next unit carefully. And I don't want to add too many more models either. I didn't think it would be so hard to find something to fill 140 points. There's tons of goodies to buy with 140 points! Like more dreadnoughts! or a Vindicator!